Today is a milestone for this blog. It marks my 100th post AND my one-year blogiversary. Yay! One year ago, my goal was to write a blog to stay in touch with family and friends around the country, and to share my craft projects, domestic fun, photography, and outdoor adventures. I wanted to try to write an average of two posts a week. That worked out pretty well because here I am with 100 posts, exactly one year later. This is my all-time favorite blog. They provide a wealth of information, from sewing, patchwork, knitting, crochet, sewing machine advice, tools, and more. I think I make most of the projects they offer. Right now, I’m finishing up making these patchwork coasters, and I’m going to start a tablerunner this weekend. So many wonderful ideas that I can’t quite keep up with (but love to try)! I can’t wait to visit their shops in NYC during our upcoming trip. Linda creates so many wonderful things. But she has THE best original, creative ideas, from sewing to crochet to paper crafts. I “met” her when I participated in her patchwork and scrap swap in Fall 2007. Then we ended up in an ornament exchange together, and I have been a follower ever since. Plus, she seems like the kind of gal I would love to hang out with in person! I found Liz through that patchwork swap we both participated in during Fall 2007. She created a cool patchwork tote bag for me and shared some scrap fabrics that I’m making into log cabin blocks. Besides Liz’s wonderful crafting ideas, she is very insightful, thought-provoking, and inspirational. Often times, I like to check her blog during a stressful work day because she always seems to remind her readers to take a deep breath and breathe. The creative women behind these wonderful blogs gave me ideas and the confidence to get out there and share my ideas too. There are so many more creative women in my blogroll who are inspiring me these days, so be sure to visit them too. To celebrate my two milestones here on this blog, I am doing two giveaways: sets of vintage-style Christmas fabrics. 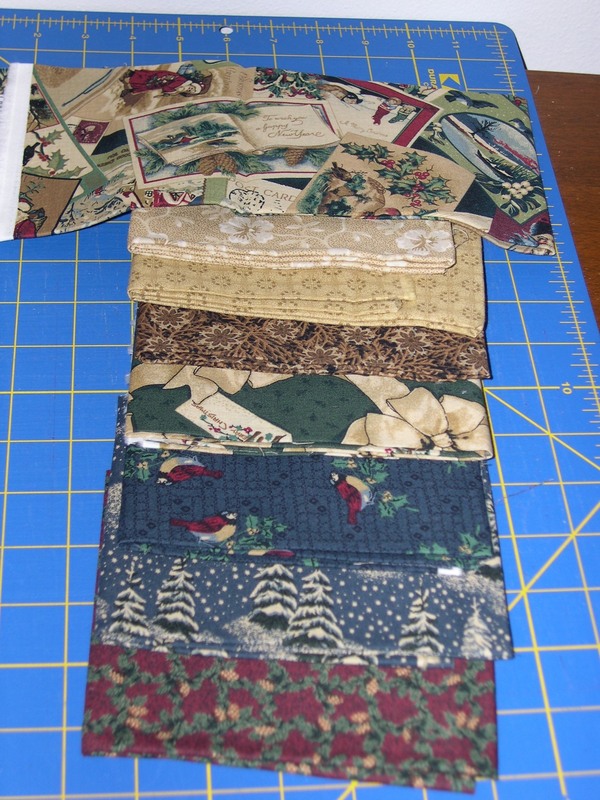 The first set contains fabrics with garland, trees, birds, and the focus fabric has old-fashioned Christmas postcards on it. Great for napkins and placemats. 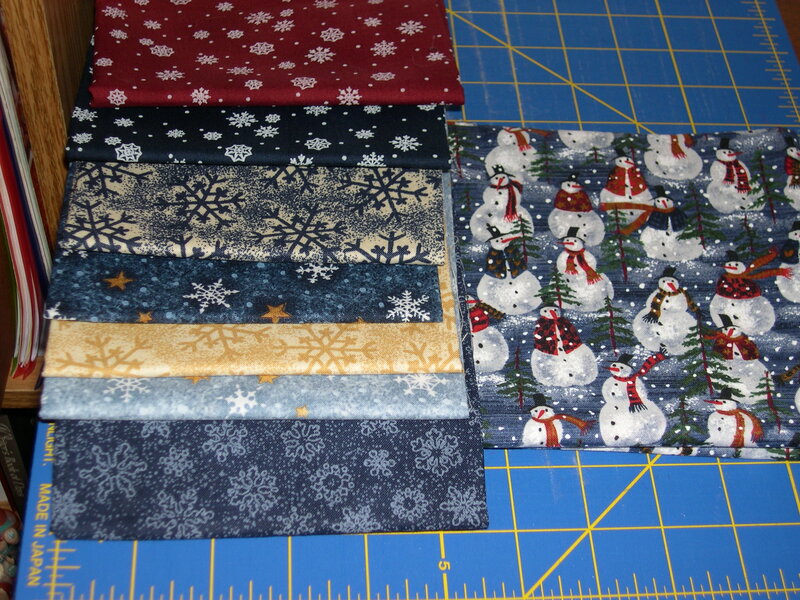 The second set contains snowflake fabrics and a focus fabric of snowmen. Great for a table runner or a patchwork basket (or whatever YOU want to make with it)! 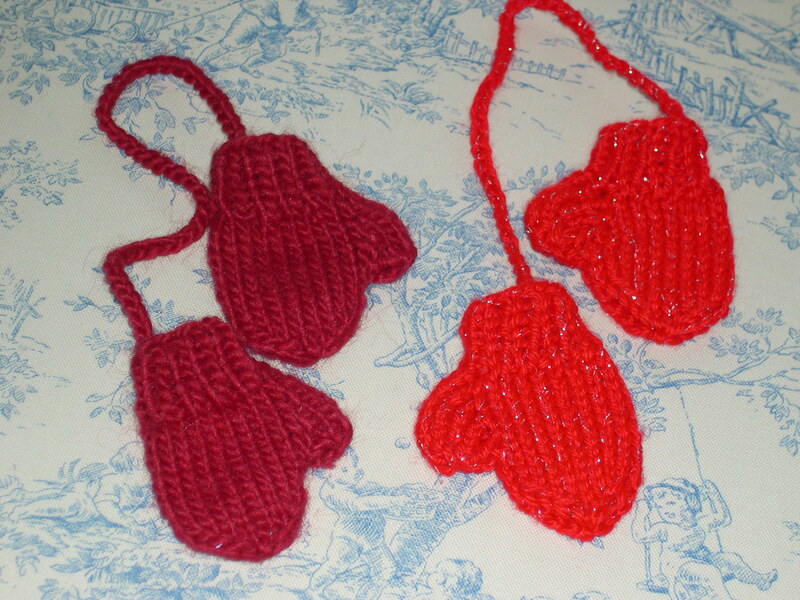 I also love knitting these cute little min-mitten ornaments, so I will include a pair of those too, along with some other surprise goodies. Just leave a comment by Saturday night if you want to be entered for my little giveaways. I would love to hear what your favorite homemade gift is to give at Christmas time. Also let me know which set of fabrics you prefer. I will do a random drawing on Sunday and send out packages right away. Thanks for your encouragement and for stopping by at some point over the past year! Here’s to another year of blogging, creating, and sharing. This is my first attempt to make stockings this year. I am making them out of burlap and adding an applique of some sort and a handwritten letter of encouragement to each recipient! I am using up the stash and not buying fabric right now. But I know I could WIN some!! Happy 100! I am always inspired by your lovely creations and photos! My favorite gift to make? I would say jar-mixes, where you put all the dry ingredients for cookies in a jar and add a tag with instructions on how to make them. They are simple and fun to make. I like the snowy snowmen set. Too cute! I enjoy making afghans and baby quilts the most. This year I am spreading my wings and making more sewn gifts…skirts and lounging pants, etc. I’m also baking cookies and I may make candy if time doesn’t run out. I like the snowmen best, but both giveaways are lovely. Congrats on reaching 100 posts and meeting your two posts per week goal! Way to stick to it (I’m impressed, I don’t have the tenacity to blog myself). My favourite gift to make is food gifts, like Randi above. This year it’s cookies but in the past I have done preserves and jams, crocheted dish cloths, painted wooden boxes, totes and that sort of thing. I like both sets of fabrics so if I’m the lucky one – surprise me! I adore your mitten ornies by the way. That is super cute. I wonder if I could figure out how to crochet similar ones (I can’t knit and believe me, I’ve tried). And big IF, if I win, I’ll be away from the 22nd to December 8th so any emails sent then will have to wait until my return! I just recently found your site through SEW MAMA SEW. I read your pattern review and loved it so came to check out the rest and have been very inspried. I love to make quilts. Although I am just getting started I am working on lap quilts for gifts this holiday season. I love the fabrics you have chosen and would be thrilled to get either one. Congratulations agian and keep up the good work. I enjoy making quilts for gifts. It gives me joy to go into someones home and see them in use. The fabrics you have chosen are both great!! Congratulations on 100 posts and the blogiversary! Also thanks for the info. on the other blogs…I’ll be checking them out! This year I’ve made 14 tablerunners, hot pads, and patchwork baskets for Christmas gifts. And, I’m always looking for new ideas to give, so I’ll be checking back to read your comments! What fun fabric. Congrats on your blogaversary. Great milestone and good luck on the next 100 posts. Congratulations Terri! This is wonderful! I enjoy making a wide variety of things, I’ve made a couple of soft Christmas trees for co-workers already, and I have a couple of doggie jackets, and doggie biscuits, and blankets for babies, and bibs, and sweatshirt sweaters to go! And oh yea, some great bags/totes to go with these! Happy One Year Blog! Exciting. The mitten ornaments are too cute. What lovely assortment you are sharing with us, your generosity really shines. I made some of those little mittens many years ago and I still hang them every year. They are just too cute. Happy 1 year Anniversary! Your blog is one that inspires me! I love to knit scarves for friends and family as gifts. I live in Upstate NY so they are much appreciated! I love both your giveaway fabric collections but the snowflakes are my favorites. The mittens are adorable too! Wow 100 posts – you certainly can be proud. I love all your inspirational ideas. My goal this year is to make some homemade ornaments for the tree. Your little mitten ornaments would be perfect!